Riser is compatible with a 6 Ft. folding table with 3/4" Edge. Converts table into bar height for serving drinks. 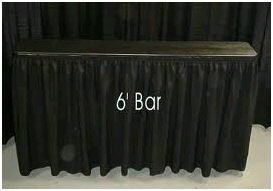 ** Please call us for any questions on our bar riser 6 foot with 2 clamps rentals in Fairview Heights IL.